A young man dropped out of high school and took whatever job he could to pay his rent. He worked in numerous bars beating out jazz tunes on the piano. He developed quite a following. One night a tipsy customer, a regular at the bar, demanded that he sing. The piano player protested, saying he was not a singer. However, the bar owner encouraged him to sing in order to make the customer happy. The piano player sang to an audience for the first time. This 'opportunity' led to the world famous singing career of Nat King Cole (Cole, 1971). they have serious doubts about their own ability to succeed in college. I was first employed at a community college as an adjunct instructor. I taught two classes and had only ventured into the part of the college in which I taught classes. One day I decided to explore other areas of the campus. I was standing in a hallway, trying to decide which route to take. Behind me came a smiling voice who said, 'You look lost. Can I help you find anything?' I had to laugh. It was true that I was lost, but I explained that I was just exploring. I was given a quick explanation of the room numbering system and the logic of the 'grid system' on which the campus was planned. When telling a friend about my experience, I said, 'I didn't even have to ask for help. Someone just recognized that I might need assistance and offered it freely.' For a first-generation, non-traditional, academically underprepared, or uncertain new student, getting help without even having to ask can make the difference between starting a college career and leaving without ever trying. Community colleges work hard to engage students in learning. Students often have to first learn how to be a college student, how college is different than high school, how to ask for help, and what resources are available. Faculty members provide opportunities to get to know their students and listen to their concerns. 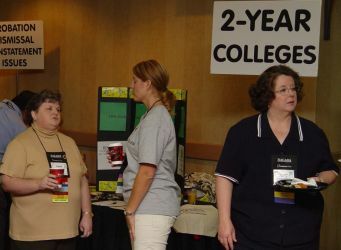 Faculty members get involved as sponsors of student organizations. They meet with study groups and offer tips on studying for their class. Faculty members call or email students who are not attending to find out what is interfering with the student's performance. They challenge students to live up to the students' own dreams of success. They show students how to beat the odds. Community colleges do a great job elevating students. They let students know that they are doing a great job. Almost every office in a community college has a way of rewarding and celebrating student achievement. Sometimes the reward is through scholarships. Other times it is through articles in the paper, pictures displayed on a 'Wall of Fame', plaques or certificates for being 'outstanding' in something. Before long, students begin to be impressed with themselves. They begin to view themselves differently. They begin to see themselves as 'college students,' and they begin to feel comfortable in the college and realize the successes that familiarity can bring. Confidence gives students the opportunity to tap into their own unknown resources. These may be intellectual, social, or personal resources. Through these previously unknown talents, community college students can begin to find their voice and sing. Cole, Maria. (1971). Nat King Cole; an intimate biography. New York. W. Morrow.